The hinge cover enclosures are manufactured for the most common battery sizes made by Concorde and Deka (MK); other manufacturers make similar sized batteries but they are not listed. Each enclosure has a removable controller mounting plate. Louvers are punched on the two sides - low on one side and high on the opposite side to promote convective flow through the enclosure. The boxes have a stainless steel padlock hasp and two 7/8” diameter conduit entries for 1/2” conduit fittings. Two U-bolts are provided with each enclosure. Enclosure sizes other than those listed below are also available. Keeping with our reputation for providing tough products our battery enclosure line is no exception. 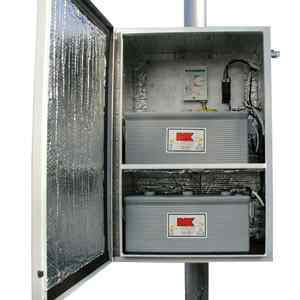 All POWER-FAB battery enclosures manufactured by Direct Power and Water Corporation are built to high standards to provide a rugged, high quality product. Standard enclosures are available in two basic types: a front opening Pole Mount and a Chest-Style pad mount. The Pole Mounts are available in screw cover and hinge cover designs. The screw cover enclosures are produced in single and dual battery designs. These hold the Group 27 and Group 30 case sizes; they also accomodate various Concorde batteries. All standard hinge cover pole mount enclosures are manufactured for the Deka (MK Battery), Concorde, and 220 AH/6-volt “golf-cart” type batteries.